Fall is upon us and the days are getting shorter. No shortage though of women artists exhibiting their work in Los Angeles this month. Here are just a few recommended exhibitions. Something Blue. A selection of artworks by Betye Saar from 1983 to 2018, all featuring the color blue. In these examples blue was used as a means to explore such concepts as magic, voodoo, and the occult. In her new assemblages dating from 2018, Saar revisits the holistic inclusion of various religious objects, totems, talismans, and charms in the materiality and temporality of her work. Thru 12/15/18. Also on view is Holding Up 1/2 the Sky, a group exhibition with works by Echiko Ohira, Karen Hampton, Mika Cho, Blue McRight, Kyungmi Shin, Victoria May, Chenhung Chen, Lisa Bartleson, Adrienne DeVine, Maria Larsson, Rebecca Niederlander, Cole James, Camilla Taylor and Alexis Slickelman. These artists employ wood, clay, wire, glass, sound, fabric, paper and other matter to delve into the ways which materiality and divine energies converge. Thru 12/12/18. “It has been written of Riley, famously, that No painter, dead or alive, has ever made us more aware of our eyes than Bridget Riley’ (Robert Melville, ‘New Statesman’ magazine, 1971). Thru 1/26/19. Hauser and Wirth presents Analogue, a exhibition of a project of photographs by Zoe Leonard. This is coinciding with the retrospective of Leonard’s work at MOCA. The landmark, decade-long project, ‘Analogue’ (1998 – 2009) is comprised of 412 photographs arranged in grids and organized into 25 chapters. 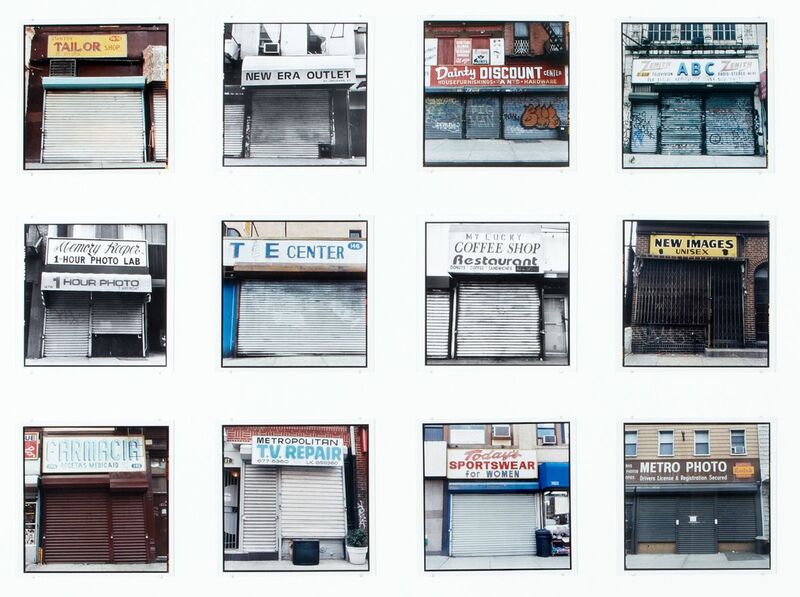 The images in this installation depict storefronts and objects on the brink of obsolescence due to an expanding global economy and rapid technological advancements emerging at the turn of the millennium. They serve as an allegory for globalization. She traveled from NY City to roadside markets across the world tracing the circulation of recycled merchandise. Thru 1/20/19. Marie Thibeault: By Water, By Fire is the current exhibition at Launch L.A. In the vibrant paintings by this California artist, she places architectural structures within organic spaces. She “attempts to reconcile the tension between instability and balance, breakdown and recovery”. Thru 12/22/18. The Pasadena Museum of History has a fascinating exhibition: Something Revealed; California Women Artists Emerge, 1860-1960. This exhibition of more than 200 pieces showcases just a fraction of the countless number of women who were working in the arts beginning in the mid-nineteenth century in California. From traditional to abstractions, focusing on works produced between the mid-1800s through the 1950s, the exhibition presents an eclectic array of oil paintings, works on paper, ceramics, metalcraft, textiles and sculpture. The exhibition, loosely divided into themes, explores the wide breadth of what women could and did accomplish as they overcame any notion that their art was in anyway inferior to their male counterparts. Curated by Maurine St. Gaudens Studio and accompanied by St. Gaudens’ four volume book, Emerging from the Shadows; A Survey of Women Artists Working in California, 1860-1960. (this info is from their website). Thru 3/31/19. 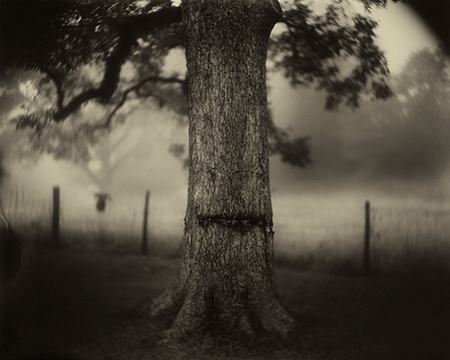 Mid-month, Sally Mann: A Thousand Crossings will open at the Getty Center. Themes of family, memory, mortality and Southern landscape are explored as a repository of memory-both collective and persona. Mann’s photographs-many not exhibited before also expose how her relationship with the land as well as her relationship with the South has shaped her work. 11/16/18-2/10/19. The Museum of Contemporary Art, Los Angeles (MOCA), has reinstalled the monumental wall work by Los Angeles-based artist Barbara Kruger, Untitled (Questions) (1990/2018). It is on the north facade of The Geffen Contemporary facing Temple Street. The emblematic red, white, and blue artwork was originally commissioned by MOCA in 1989 for the exhibition A Forest of Signs: Art in the Crisis of Representation and was last installed in 1990 on the south wall of MOCA’s then Temporary Contemporary building. The work holds an iconic presence in the collective memory of Los Angeles’ art community and is considered part of the museum’s curatorial highlights over its forty year history. The work includes nine questions such as “Who is beyond the law?”, “Who is bought and sold?”, and “Who is free to choose?” The artwork uses these questions to point to issues of patriotism, civic engagement, and power relations. The work will remain on view through November of 2020. MOCA Geffen Contemporary will be presenting 2 highly anticipated exhibitions. 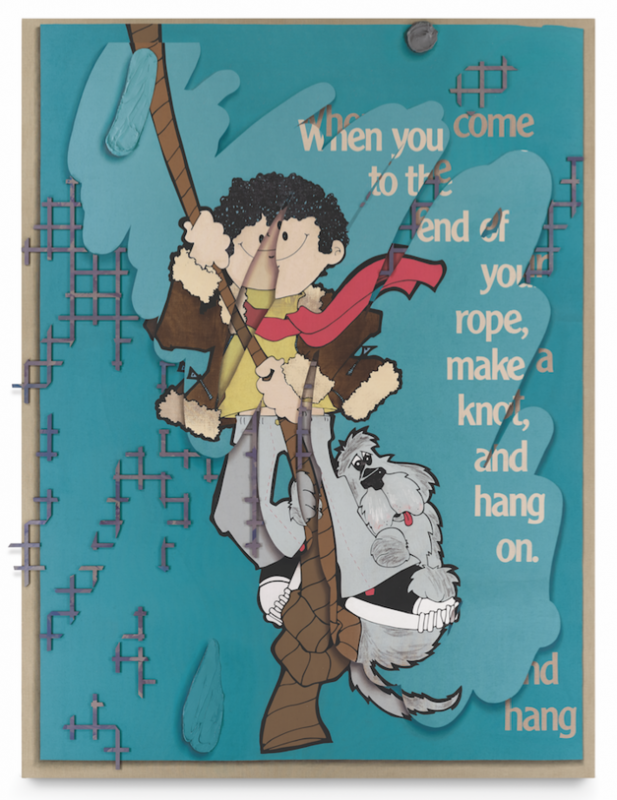 The first is a mid-career survey of the work by Laura Owens. It will feature approximately 60 paintings from the mid-1990s until today. Owens has pioneered an innovative approach to painting that has made her one of the most influential artists of her generation. Her bold and experimental work challenges traditional assumptions about figuration and abstraction, as well as the relationships between avant-garde art, craft, pop culture, and technology. Simultaneously a survey of the work of artist Zoe Leonard will also be at the Geffen Contemporary. Over the past three decades, she has produced work in photography and sculpture that has been celebrated for its lyrical observations of daily life coupled with a rigorous, questioning attention to the politics and conditions of image making and display. The exhibition looks across Leonard’s career to highlight her engagement with a range of themes, including gender and sexuality, loss and mourning, migration, displacement, and the urban landscape. 11/11/18-3/25/19. Thanks for all of the work you do to support artists…I love your blog and it leads me to good things. Go Karen! I am so happy you wrote about the show at the Pasadena Museum of History. A review in The LA Times intrigued me, but I lost track of it. Both my grandmother and great grandmother were of that era of early California women painters, and I am interested in the work of this show’s curator.